The overall feeling of the room was inspired by a painting titled "Dandelion,” with its beautiful palette of blues, greens and yellows. Just as the dandelion makes one smile, the intention for the room was to leave a smile on everyone's face when they enter. A primary consideration for the room was that it be gender neutral. Colors, textures and patterns were selected to provide comfort for boys and girls, as well as their parents and family. Also paramount to the design was making sure all elements could endure extreme wear and harsh conditions, in addition to years of normal wear and use. The playful black and white illustration on the Wonder wall incorporates iconic views of almost everything “New York.” The idea behind this creation was to take children and families on a journey and escape by discovering everything New York. It gives them a creative outlet and opportunity to express themselves through color therapy on a larger than life coloring book. Just by using dry erase markers and a swipe, it can be easily erased and ready to repeat. 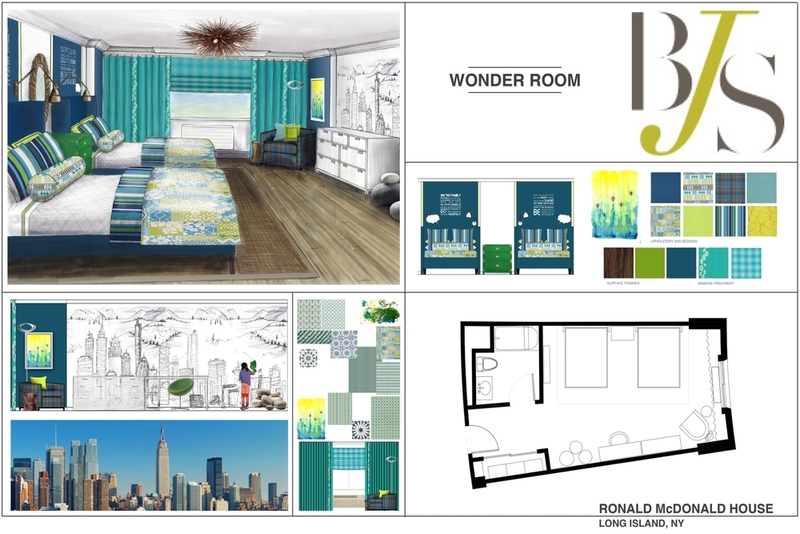 The design challenge for both the bedroom and bathroom was to make sure that it would withstand the test of time. It also needed to be dramatic, modern, but more than anything, practical. It was accomplished in the bathroom by providing countless elements to ease the daily needs of getting ready, while also providing the calming and peaceful features to allow the families to prepare for rest.